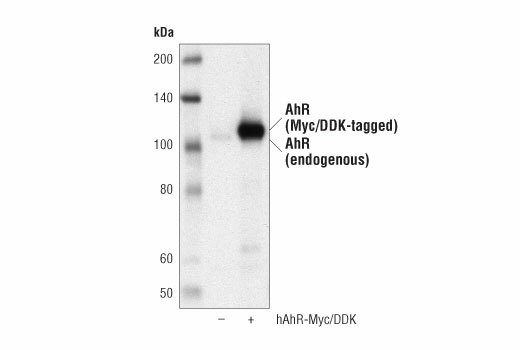 Western blot analysis of extracts from 293T cells, mock transfected (-) or transfected with a construct expressing Myc/DDK-tagged full-length human AhR protein (hAhR-Myc/DDK; +), using AhR (D5S6H) Rabbit mAb. 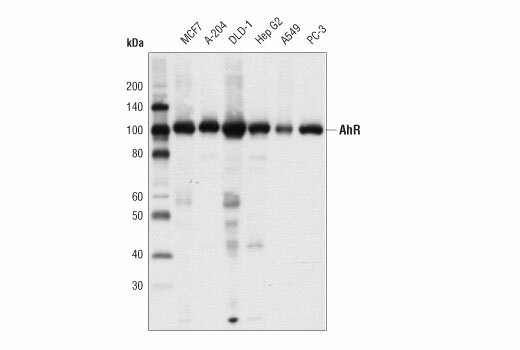 Western blot analysis of extracts from various cell lines using AhR (D5S6H) Rabbit mAb. Immunoprecipitation of AhR from A-204 cell extracts. Lane 1 is 10% input, lane 2 is immunoprecipitation with Rabbit (DA1E) mAb IgG XP® Isotype Control #3900, and lane 3 is immunoprecipitation with AhR (D5S6H) Rabbit mAb. 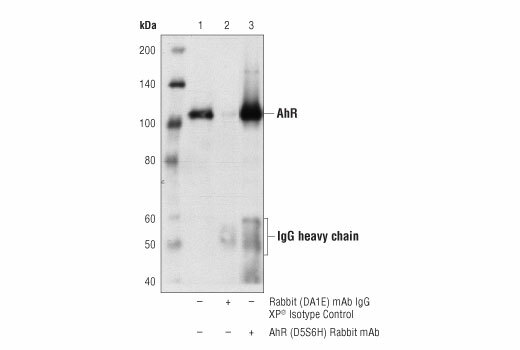 Western blot analysis was performed using AhR (D5S6H) Rabbit mAb. Chromatin immunoprecipitations were performed with cross-linked chromatin from T47D cells treated with BNF (1 μM, 45 min) and either AhR (D5S6H) XP® Rabbit mAb #83200 or Normal Rabbit IgG #2729 using SimpleChIP® Enzymatic Chromatin IP Kit (Magnetic Beads) #9003. The enriched DNA was quantified by real-time PCR using human CYP1A1 promoter primers, SimpleChIP® Human NFE2L2 Intron 1 Primers #81126, and SimpleChIP® Human α Satellite Repeat Primers #4486. The amount of immunoprecipitated DNA in each sample is represented as signal relative to the total amount of input chromatin, which is equivalent to one. 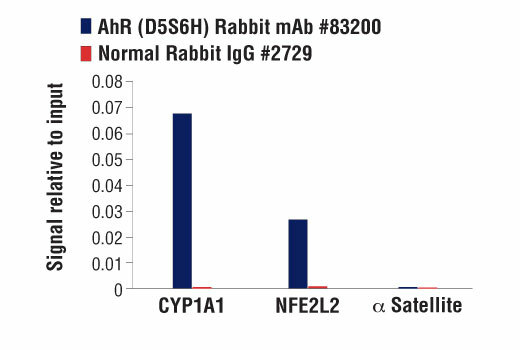 AhR (D5S6H) Rabbit mAb recognizes endogenous levels of total AhR protein. Monoclonal antibody is produced by immunizing animals with a synthetic peptide corresponding to residues near the carboxy terminus of human AhR protein. The aryl hydrocarbon receptor (AhR) is a ligand activated transcription factor involved in xenobiotic metabolism, cell cycle regulation, and development in response to both endogenous and environmental signals (1,2). AhR was initially identified as a receptor for dioxins, which are environmental pollutants generated by waste incineration and other industrial processes (3,4). AhR ligands include polycyclic aromatic hydrocarbons, including the carcinogen benzo(a)pyrene and other components of cigarette smoke (3,4). Naturally occurring AhR ligands include flavonoids, which are aromatic plant secondary compounds commonly found in vegetables and fruits (3). Cytoplasmic aryl hydrocarbon receptors are found in protein complexes with heat shock proteins. Upon ligand binding, AhR dissociates from heat shock proteins and translocate to the nucleus where it dimerizes with AhR nuclear translocator (ARNT, HIF-1β). The AhR/ARNT heterodimer binds to nuclear xenobiotic response elements to control the expression of genes associated with xenobiotic metabolism, including several cytochrome P450 genes (5,6). AhR is ubiquitously expressed and is thought to play a role in regulation of cell proliferation and differentiation, cytokine expression, and xenobiotic metabolism (2). Research studies link AhR activity with the control of regulatory T-cell and T-helper 17 cell differentiation, regulation of the inflammatory response, and the onset of lung cancer (1,2,7,8). Quintana, F.J. (2013) Immunology 138, 183-9. Tsay, J.J. et al. (2013) Anticancer Res 33, 1247-56. Denison, M.S. and Nagy, S.R. (2003) Annu Rev Pharmacol Toxicol 43, 309-34. Poland, A. and Knutson, J.C. (1982) Annu Rev Pharmacol Toxicol 22, 517-54. Denison, M.S. et al. (2002) Chem Biol Interact 141, 3-24. Beischlag, T.V. et al. (2008) Crit Rev Eukaryot Gene Expr 18, 207-50. Quintana, F.J. et al. (2008) Nature 453, 65-71. Hayden, M.S. and Ghosh, S. (2004) Genes Dev 18, 2195-224.